Foreign investors often find China’s financial system to be one of the most difficult areas to navigate when establishing or growing their presence in the country. Navigating China’s tax system, and its complexities, requires time and commitment. In this issue of China Briefing magazine, we look at the factors that make China’s tax system unique, and identify steps foreign investors can take to manage its challenges. We first examine the issues that most commonly disorient foreign investors. We then discuss the importance of pre-investment capital planning, within the context of tough foreign exchange controls, before examining the ever-maturing regulations for the transfer pricing system. Why do Foreign Investors think China’s Financial System is Complex? Foreign investors often find China’s financial system to be one of the most difficult areas to navigate when establishing or growing their presence in the country. Navigating China’s tax system, and its complexities, requires time and commitment. That should not come as a surprise. The World Bank recently ranked China 130 out of 190 jurisdictions for ease of paying taxes, for example. Overseas-based financial administration teams too often find that mastering the financial system in China is more complicated than in other jurisdictions. A complex bureaucracy and licensing regime, idiosyncratic features, strict capital controls, and frequent audits – as well as pronounced regional variance – all contribute to this complexity. These issues are borne of seemingly mundane day-to-day tasks, such as issuing invoices known as fapiao, as well as for more complex and strategically important issues, like profit repatriation and intercompany payments. 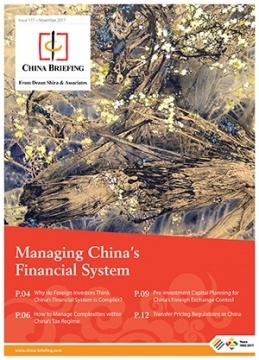 In this issue of China Briefing Magazine, we look at the factors that make China’s financial system unique and complex, and identify steps foreign investors can take to overcome the resulting challenges. First, we look at the issues that most commonly disorient foreign investors. We then take a closer look at some of these complexities, and what businesses can do to manage them. Next, we discuss the importance of pre-investment capital planning in the context of tough foreign exchange controls, before examining the ever-maturing regulations for the transfer pricing system.